If you’re a Malaysian, you’d probably have known about the recent “potong” phenomenon. Yeah, potong! However, this entry is not entirely about “Cut the wires. Cut the charges. Cut the lag”. It’s about a potong country. By the way, potong is “cut” in Malay language. Quite recently a new wireless broadband provider, called P1 WiMAX, has somehow trademarked the word “potong” to themselves. 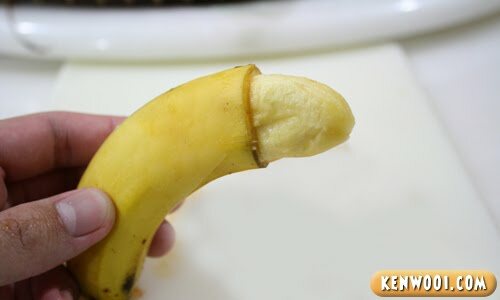 Whenever anyone talks about potong, it’s always about P1 WiMAX, or a more common meaning to many men – circumcision! Take a look at one of their advertisements. Yeah, believe it or not, I’m one of the people featured on their advertisements! Cool right? Okay, actually, don’t believe it. I haven’t cut also anyway. Since Malaysia is an Islam country, and the majority of the citizens here are Muslim, it’s not surprising that many of Malaysians potong their little brother. Not only the Muslims, even other races are doing it too. But if you asks someone whether they cut already or not, they might think you’re talking about P1 WiMax (Read Point 1). Getting your bonus/commission reduced is quite common, especially when you’re on a bad performance. Bad performance = Angry boss = Money potong-ed! This is probably common throughout the world and Malaysians are probably the best at doing it. At the shopping mall or at the movie ticket counter, chances of bumping into a potong-queue-person is quite high. Even vehicles like to potong queue. If you’re unlucky, you might just get yourself a penalty ticket. And if you do get a penalty ticket from the policeman or the city council authority for the wrong doings on the road. You can always potong the amount of the penalty ticket too. Yeah, RM20 reduced to RM10. Yeahhhh, 50% discount! I guess the best way to describe ‘potong stim’ is that your mood is deflated by something anti-climactic. even potong can be an entry for u ah kenwooi. creative! Can’t believe you sliced the banana skin! Hahaha Good one! Haha! So many things to potong in Malaysia! I think I only want the last one – potong penalty. Potong until kosong! Haha! Haha ! !good 1 , 1 malaysia, semua kena potong potong potong! If gamble, potong jari ! in malaysia everything can be potong-ed. haha! lets help to make this dictionary more complete. interesting… we are 1malaysia ma… everything also potong..
One more thing M’sia also quite famous, esp during childhood times: ais krim potong! 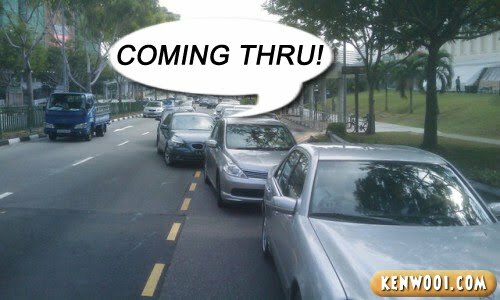 Btw, the car cut queue photo, by looking at number plates, type of cars, the road condition & signs, taken in singapore one…tis shows potong phenomenon is at everywhere. so, you got potong anot? haha…the banana is so funny…great post! ‘Potong’ is very popular in malaysia 1…1 malaysia! another one is …. like MCA… you not support me,, i potong u! i potong Q once n i was saman straight away..very unlucky..
i even asked for potong penalty before..
potong potong…streamyx deserved to get potong-ed by us!!! Don’t ‘potong’,P1 dns server change every 3 days. Adoi… that poor banana… lol.. u ah! hahahaha #2 cracks me up! HAHA! x) This is SO true. Nice post :P You poteng aldy? 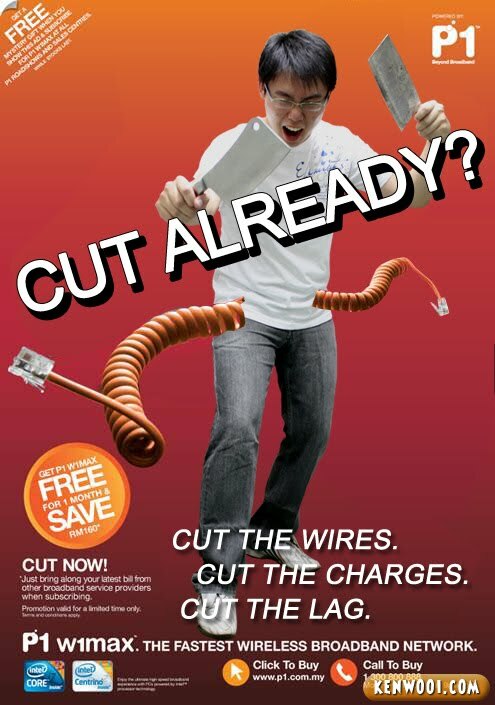 streamyx also counter the potong ad with potong tag line. theres new develepor near my place also use potong tag line. the tag line is getting old and lame and annoying. So funny eih….same here in Brunei maaa…. mampos aku kenwooi oiiii.. bukak ur blog kne standby dictionary! wa wa wa! haha.. u re such a kidder. wah.. ur blog has really grown eh.. and where on earth do u get such ideas?? and how much time u spend blogging?!! hahaha funny, but its true eh. So many ‘potong’ here.. Hehe.. Your post on “potong” is cracking me up, keep it up! An accurate description of how things work here indeed. You should upload the Kompang kids singing the “Potong! Potong! Potong!” ad!!!!!!!!!!!!!!!!!!!! omg! the pictures were entertaining… especially the… ahem… banana!!!! HEHE! i wonder how you could specially peel off only the top part of the skin though! hahhahahhaha bravo2…very creative of u!..this is sooo funny..keep it up..
u got potong a not??? Haha. Very funny post. It made me laugh! ur good at cracking jokes like these..
OMG LOL. Great post. Anyways, wuah! the last photo. Get 50% discount? Here, we have some parking lot have to pay parking ticket but most of the ppl in Sabah doesn’t pay. When you exceeded the limit of not paying for 21 days, additional cost. But here’s the tricky part, to make you pay, they give you 95% discount. Mmg WTH. Reminds me of the short film ‘POTONG SAGA’ by Ho Yuhang. haha! Yeah. Potong queue is one of them. Nice picture on it & good reading i must add :). ken, have you POTONG already? It does look off but it still looks like it. how about the Streamyx retaliation ads on radio? always got some form of sexual innuendo. haha..
i don’t know malay, but potong sounds like such a funny word to say. This is hilarious! I like the banana photo! This is a very funny post – everything and anything about “potong” :o). Now that you have listed it out, I also have to agree with you hahaha! This potong post is nice! hahahaha. yeah …potong is so so malaysian! haha… very funny.. good research. u remind me potong ice-cream. check this out for ice-cream potong. I’m taking about the internet of course. huhu, that’s sure a hell lots of things to potong xD well, jangan-lah potong stim for our malaysia :D still part of our malaysian culture and we’re supposed to be proud of it! Hahahah loved this post. I remember the first time I heard the phrase “potong stim” from my cousin. Brings back memories haha! Keep up the good work ya? Come to Sarawak – we have potong pala’ (kepala). Once we were known as the Land of the Headhunters! Scared or not? LOL!!! kinda a horny post eh? watsup with ya? hahahahhaha. lol the first time i heard the ad. it was so twisted. yup there was a cosplay event in times square that day. it was the day after the graduation. u’re originally from kl? firstly….sorry for my late reply and visit to here. busy at work. yeah…potong ler…everything in msia is potong ler….like ur post man…very true! which one have you potong-ed? both links will bring u to the same page. nowadays the “potong” phenomenon is all around us. anyway i’m working with the company that P1 asked people to “potong” and we are very offended with the ad. it is no doubt that the ad is very effective… but is the product / service really good? try first lor. hehe. hahahahah creative elaboration about potong2 ha! good one! this post is freakin hillarious ! really like this post! LOL! hahahaha. u’re funny dude. by the way that is what happened in malaysia right? Ha haha.. You must potong also..
Potong is good in some way…..
i always very dissapointed about the way malaysians are driving. a friend told me that if PI wimax potong your line because of late payment they will only connect back after 2 weeks,is it true ah? Sekarang ni kecoh pulak pasal government servant nak kena potong COLA. wanna know its real meaning?? 1malaysia? u really think got such thing exists now?